My horse, “Rivet,” was recently featured on EquestrianCoach.com (http://equestriancoachblog.com/), a website created by Bernie Traurig, who famously reached the top of the sport in all 3 of the International Equestrian Olympic disciplines: Show Jumping, Dressage, and Eventing. His educational website opens the door to a wealth of knowledge provided by some of the best riders, coaches, and industry professionals in the world. It has a library of hundreds of instructional videos and continues to amass topics every month. The core instruction on the site follows the principles of the American Hunter/Jumper Forward Riding System and will benefit those in any jumping discipline at any level. Additionally, it provides information from Dressage, Eventing, and Western Reining Olympians and World Champions, as well as from top veterinarians, farriers, judges, course designers, sports psychologists, and other accomplished equestrian specialists. I am honored to be included on this wonderful website and want to thank Jennie Carleton for writing the article and Bernie Traurig for his dedication to the betterment of the sport worldwide. 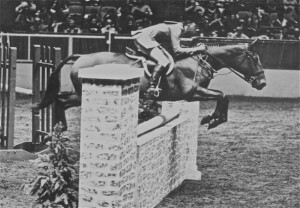 Anna Jane White-Mullin jumping the last jump at 1971 Maclay Finals. Photo by Budd. There are great riders and great horses, but there’s a certain magic that happens when just the right combination is paired together. Anna Jane White-Mullin and her Thoroughbred horse, “Rivet,” are an excellent example of such a partnership. Their story is one of hard work, horsemanship, and the heart of a thoroughbred. 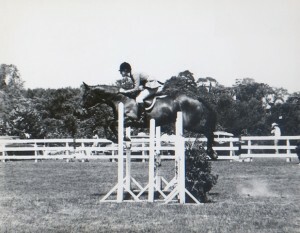 Anna & Rivet Riding Without Stirrups at Ox Ridge in 1971. “We bought Rivet from the well-respected Hungarian horseman, Gabor Foltenyi, who was running a barn in Michigan at the time. He was working to develop trust between himself and Rivet, who had been physically abused by a young male rider. Gabor’s stated philosophy was, ‘You get more from a horse by winning his confidence and allowing him to enjoy the sport, and then keeping him, at all times, under gentle but complete control.’ I watched Gabor quietly tack up the horse with flowing, gentle movements that made me realize he was trying to gain the horse’s trust. Gabor was famous for his ability to develop a horse through flatwork, and this really showed when I tried out Rivet. He was a beautiful mover and the most supple horse I’ve ever ridden, so we were pleased to be able to buy him. 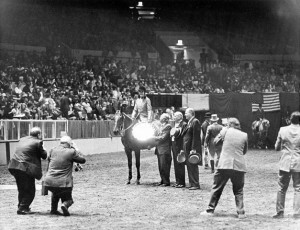 We were told that he was suspicious of almost everything and had to be dealt with quietly to get the best from him; but it was still a surprise at the first horse show when my father went into the stall to feed him and Rivet sat down on his haunches in the corner, looking wide-eyed and panicked. “Later that day, he had to be measured before we could compete in the junior division, and the steward said he measured as a Large Junior Hunter. I tacked him up and showed in my first hunter class at the Ox Ridge Horse Show and was lucky enough to win it. Afterwards, my coach, George Morris, said, ‘How did this horse get measured as a large? He couldn’t be a large!’ So we had Rivet measured again, and he came up as a small. I was then faced with the decision of whether to keep my points for the win in the Large Jr. Division and show as a large for the rest of the year, or to forfeit those points and show in the Small Jr. Division thereafter. I decided to keep the points and continued to show him as a Large Jr. Hunter for the rest of my time with him. After he was sold to Bradley Caine at Winter Place Farm in Maryland, he was measured again and shown as a Small Junior Hunter thereafter. 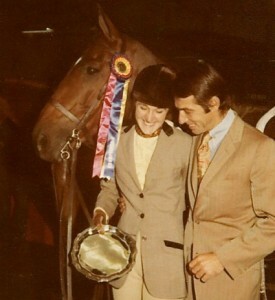 Anna & Rivet, 1971 Maclay Finals’ Presentation at the National Horse Show. “Rivet turned out to be an interesting horse to show. He was easily spooked, so I had to longe him or give him a controlled gallop on the show grounds to work him down enough to score well in the early classes. He served as both my Equitation horse and Junior Hunter, and he usually came through for both. Jennie is highly involved in the horse show community. As one of the founding members of the USHJA Wheeler Museum Committee, established to highlight and educate the membership and the public on the history of the Hunter/Jumper Sport, she has assisted in the formation and promotion of every exhibit. 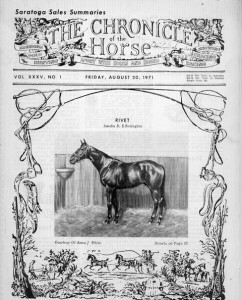 Having pursued an education in journalism, among other fields, Carleton has authored a number of articles and press releases for various equestrian publications and considers writing and horses her two greatest passions. Carleton also established and continues to manage several Facebook Groups dedicated to the history of the hunter/jumper sport and its preservation. This includes the USHJA Wheeler Museum Group, which was the brainchild of Carleton and her close friend and committee co-chair, Bill Rube. In 2015, Carleton began working for the National Horse Show as a social media coordinator, and she hopes to soon be assisting the USET Foundation as they prepare for the 2016 Olympic games.